Q1. 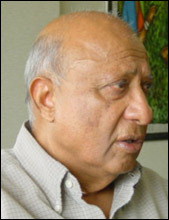 Mr. Punja, you are one of the leaders of the industry in Fiji after the Punjas Group split in 1998. Could you explain to our readers how have you achieved this in this last 4 years? A1. The company did not split, I just left it to start my own company. I joined the Punja and Sons in 1960, when it was only a store and I got the business into Manufacturing. I was Chairman and Managing Director until 1998 when I started my own company. A research shows that 90% of the family businesses collapse as the 3rd generation takes over. That was the 2nd generation of our business with five brothers in. It was my long term plan to have my own business as the family was growing and my children were at University. I perceived that with the 3rd generation the business would not get along well and I had personal businesses that were growing very well and today it is quite a big company. I have a market capitalization of about 80 million FJD. At the moment the biggest company is Flour Mills of Fiji but there are others like: AtPack, Biscuit Co. of Fiji Ltd., our Rice Company, etc. The biscuit company will be closed in order to start a new one with a 10 million FJD investment which will be operating mid this year. Q2. You are one of the first Indo-Fijian conglomerates to see the value of the SPSE to raise capital and reduce risk by opening to outside investors. Can you elaborate about the situation of your companies in the Stock Exchange? A2. After I left the family company I did not have much money so I chose the SPSE. It has helped me and a lot in the process. Flour Mills started in 1980, 1 FJD invested in that day is worth now 55 FJD. In the stock exchange, the companies are doing very well. The current venture is very well catered locally so it will not be needing any off-shore investor. I do not have any problem raising funds. For example, I floated the rice company in 1999 at 50 cents and today it is 2 FJD. Those people who invested have done very well and I am pleased with that. I would like to keep this combination so I do not have any problems raising the funds. My floats are always oversubscribed in Fiji. We export two containers a month to the US and to New Zealand. With the new biscuit factory we will expand our markets to the world but at the moment it is only Australia and South Pacific region. The new factory is modern, world standard, similar to Arrnotts in Australia. Q3. And what will be the main future investments and development plans of the group for the near future? A3. As I tie up the current venture, I intend to float a property company of about 15 acres of land in the city area in the stock market late 2003. Q4. Mr. Punja, the government has urged the private sector to increase investments in order to have a sustainable development in Fiji. What is your opinion about this? A4. The problem about the low rate of investment in Fiji is not simple. I do not think that the May 2000 coup decreased the investments into Fiji. The investments were decreasing well before the May 2000 coup. The decrease in investments has happened because global organizations like the World Trade Organization has taken away the attractiveness of investment into 3rd world countries. Most of the 3rd world countries are suffering because of the WTO. The WTO is a club of rich countries and the developing countries are being screwed by them. Fiji and a lot of developing countries are caught in their web and there is no other way out. Manufacturing based development is totally impossible. For example I was fortunate to have started my soap factory before the WTO came into existence. I started with a 90% protection on duty of imported soap, today it would be impossible because of the WTO regulations. Today, the duty of soap is quite low but we are established because we had time. When WTO came thank God I was already established, if not there would be no Punjas & Sons Co. Ltd.. In order to increase the GDP now we have to fight, we must forget about the industries because of WTO rules, industries are now a monopoly of WTO. Fiji should identify the things we have and develop them, for instance the tourism industry, the forest and timber industries, the fishery and its small but skilled labour force. Q5. Mr. Punja, since May 2000 we read in the local and in the international media how several sources relate you to the coup plot. What would you like to comment about this? A5. I would never be involved in an illegal activity. I believe I was related to the coup because I was criticising the Chaudry Government. When Chaudry became Prime Minister he was very unfair to my companies, infrastructure wise, and I was taking him to court and to the media. In the midst of this the coup happened. Mr. Qarase, who became the Prime Minister, was previously Assistant Chairman of one of my companies where I was the Chairman. These were the reasons that have caused the rumours. Yes, I did not like the Chaudry government but no, I was not related to the coup plot. Q6. Where would you place the Indo-Fijian people in the Fijian economy and where are you located? A6. Most of the Indo-Fijian people came into Fiji during the indentured system. My father came as a trader in 1914. It is true that today you will see big companies with Indian names but this gives a false impression that Indians control the economy. The wealth is with the Fijian people because they own bulk of the land with the forest and the sea. They have the asset with far greater wealth. Unfortunately, it is not being developed. Indians are in farms, commerce, taxis and other sectors. Generally speaking, I think that we have a great future in this country if we can grab the opportunities that are ahead of us. For instance, after the 1987 coup, people wanted to leave and they started selling houses valued at 200,000 FJD for 40,000 FJD in order to migrate. I bought some of the houses with a long term perspective as I saw the opportunity. Indo-Fijians have a good future in Fiji but unfortunately they are being ill-advised, their community leaders lack good leadership. The idea is to look for opportunities, to be different and to identify your own advantages. I did that and today I own the biscuit factory, the Rice Company, the soap factory & oil, etc. I am involved mostly in the food industry, in an insurance company, in two commercial radio stations and in Fiji T.V., where I own most of the shares.